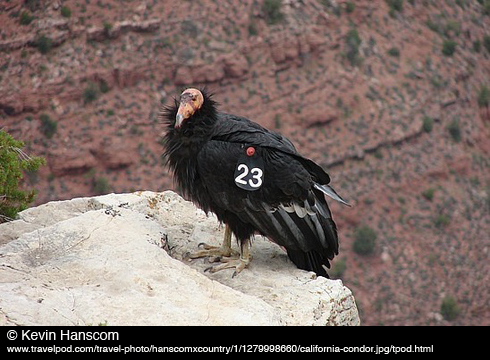 California Condor #23 is the hero of the California Condor Restoration Project. The project has worked for 30 years to reintroduce captive-bred condors into the wild. Number 23 and his mate were the first released condors to successfully raise a chick on their own. Yet today, #23 sits alone. Two years ago, his mate succumbed to lead poisoning. Condors subsist on carrion, and the smallest bit of lead shot ingested with a dead animal can sicken and kill even this largest of birds. American Bird Conservancy is promoting lead-free alternatives. A California Condor alights on a rocky precipice on the south rim of the Grand Canyon. Lucky hikers stop [Hiker trudging] and gaze in wonder at the largest bird in North America. The shiny black condor, its bare head splotched with pink, blue, and purple, keeps a watchful eye up and down the canyon wall. Number 23, along with his mate, were the first released condors to successfully raise a chick on their own. Yet today Number 23 sits alone. Two years ago, his mate succumbed to lead poisoning. Condors subsist on carrion, and the smallest bit of lead shot ingested with a dead animal can sicken and kill even this largest of birds. Arizona currently gives non-toxic ammunition to hunters, and although participation is high, it is not yet enough to prevent all lead poisoning of condors in the state. Because so many birds die of lead poisoning every year in the U.S, American Bird Conservancy is promoting lead-free alternatives and educating the public about this threat. To learn more, come to our website, BirdNote.org. Sounds of the captive Condor provided by The Macaulay Library of Natural Sounds at the Cornell Lab of Ornithology, Ithaca, New York, recorded by V.Gerwe.